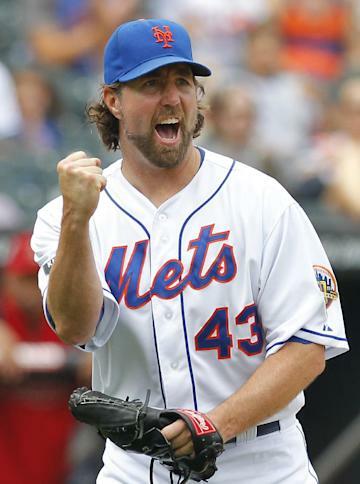 Knuckleballer R.A. Dickey and the Toronto Blue Jays have come to an agreement on contract terms, the last obstacle in a trade that will send the Cy Young Award winner and catcher Josh Thole to Toronto. The New York Mets are to receive three prospects – including catcher Travis d'Arnaud and right-hander Noah Syndergaard – and veteran catcher John Buck. The Mets and Blue Jays on Sunday struck the deal, contingent on the Blue Jays negotiating a contract extension with Dickey, who, at 38, was under contract for one more season for $5 million. Granted 72 hours, the Blue Jays agreed to extend the contract for two years and $25 million, pending a physical. The Toronto Star first reported the sides had reached the agreement. In recent weeks, the Mets had alternately attempted to negotiate their own extension with Dickey and offered him in trade. The Blue Jays stepped forward with d'Arnaud and Syndergaard, two of the best remaining in their farm system after the mid-November trade with the Miami Marlins. While the trade confirmed the Mets are in rebuild mode, it continued to define the Blue Jays as contenders in the AL East. They will have a rotation of Josh Johnson, Dickey, Brandon Morrow, Mark Buehrle and Ricky Romero, possibly the best in the division. They signed free agents Melky Cabrera and Maicer Izturis. They acquired shortstop Jose Reyes and Emilio Bonifacio in the Marlins deal. And, to an organization that hasn't played a postseason game since 1993, they return the likes of Jose Bautista, Edwin Encarnacion and Brett Lawrie. The Mets appeared to question whether Dickey could sustain the effectiveness of his past three seasons, which paralleled his discovery – and mastery – of the knuckleball. Blue Jays general manager Alex Anthopoulos clearly had fewer reservations, and continued to build the club during a time the AL East appears vulnerable. • Tony Dungy playbook: Will Adrian Peterson make NFL history?